When I think of signs that indicate spring is upon us, I often mentally conjure up visions of blooming plants, swallows circling over bodies of water, alternate plumage Yellow-rumped Warblers, and garter snakes basking to draw in the sun's warmth. There are, however, many auditory cues that also tell us spring is in the air. 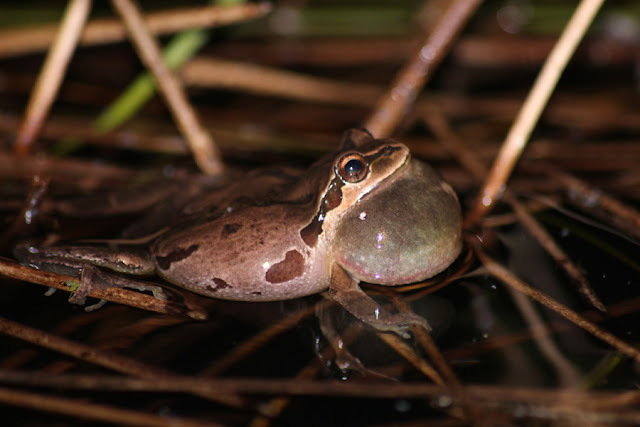 There is a small manmade pond just outside my place that comes alive with the sound of Pacific Chorus Frogs (Pseudacris regilla) after dark each evening. As winter started winding down, the odd slow-rolling croak could be heard around the pond's edge. Frogs must use calendars because a symphony of "rib-it" calls started just as spring kicked off. I have never really associated this sound with the commencement of spring because I didn't grow up next to a wetland. For the last two years, however, I have been able to enjoy the sound of dozens of chorus frogs in the background in the early spring. If you want to observe some Pacific Chorus Frogs in action, now is the time to head down to your local marsh at night with a flashlight. Make sure you're in a place where it isn't too creepy to be roaming around with a flashlight!